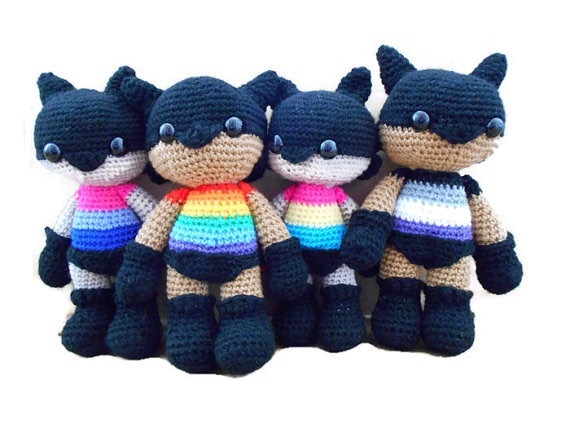 I would love to stock up my shop with all different variations of LGBT++ Superheros but I have too many new ideas on things to make and I would never be able to make them all. However, I am extremely glad for people who purchase Made to Order items from my shop. I love making these and I take pride in making them to the best of my ability. I’d like to think they keep getting better. Non-Binary Superhero / New Addition! New addition to the gang! 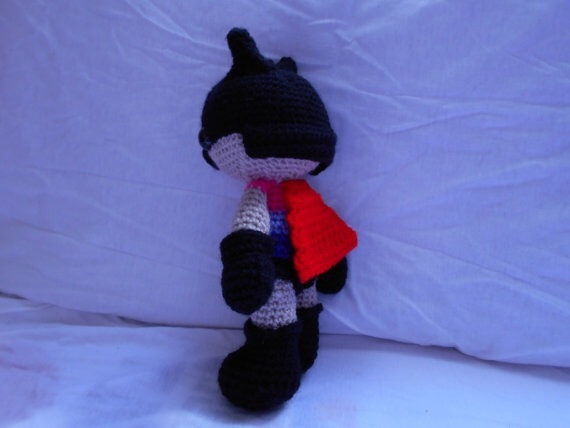 Custom Order for a non-binary superhero, and I loved making him. Comes with a little red cape, because every superhero needs a cape, right? These little are guys are really fun to make and I love the thought of people having these to reflect their identity and strength. 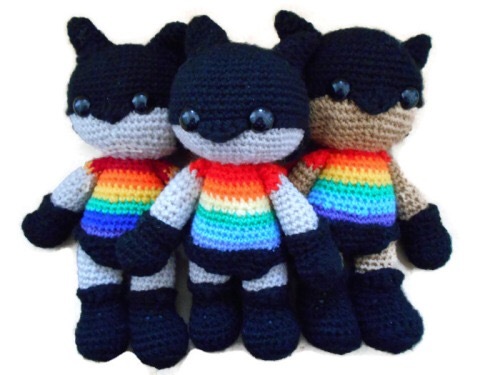 The Superheroes were first made for friends and myself, and I have other varieties of LGBT dolls, such as cats and little creatures in hats (I need a more creative name for those ones…). When I first started crochet all I wanted was to make a cute doll that reflected who I was, and I still have my little cat with a rainbow jumper and a red bow on her head sitting on my bedside table. I really love it and that’s why I continue to make these, so that others can enjoy them too. Joining the rest of the gang. 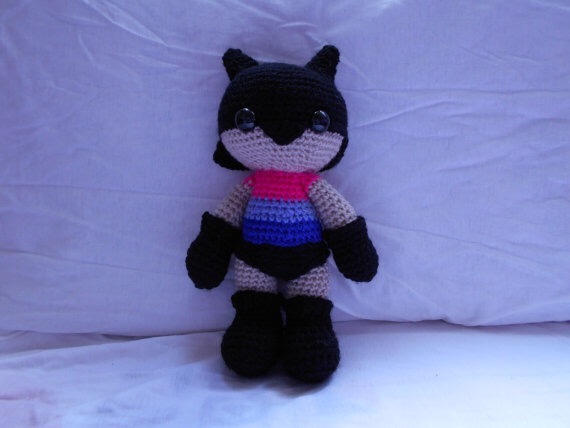 There have been other custom requests such as a transgender superhero and an asexual teddy bear (see the Sold section in my Etsy shop). And these little guys look like members of a boyband. I made these two years ago, and I need to make these again. It’s crazy seeing how my crochet style has changed even using the same patterns and same sized wool. The year is ending and I have reached my goals for my shop, to reach 50 sales. It may seem like a small amount, but this year has been crazy. I have spent this year searching for a full time and future-oriented job, trying to get through interviews and subsequent rejections, having a crisis because I don’t know what I want to do with my life, having RSI due to crochet and subsequent pain in my wrists whenever I crochet (which is the main part that hinders my productivity), moving to a different part of the country for a new job and starting a trainee position which involves numerous exams in a subject I struggle with. My year has had its ups and downs. I now have my own flat by the sea and a professional job. I have my struggles, and it’s hard at times to move forwards, but I honestly think that my crochet projects and my shop have kept me going, at least a little bit. I like making new projects and I love receiving reviews from happy customers. I have so many more ideas and would love to expand my shop, but crochet is a time consuming hobby considering how much I charge for my items. I have other creative hobbies which I would love to pursue, so maybe that’s something I will be thinking about over Christmas for new 2018 goals. Let’s see. Pride is an important event, because it’s about standing up for your identity and celebrating that with the world and the rest of your community. That’s why I like superheroes, because they are fearless and strong, they stand up for what they believe in and embrace their identity. So, because of that, I have made LGBT superheroes. They’re very colourful and cute, and I loved making them! Bisexual, LGBT, Pansexual and Asexual. I love them all together! And if anyone on Etsy has a request then of course I will add other sexualities to the group. Each superhero comes with a mask, boots, undergarments and gloves. My favourite part is their red cape that hides in the back! I’m really proud of these little guys and hope you like them too. Please tell me what you think!